Save (and savor) garden fresh goodness with these fermented pickles. A combination of cucumbers and squash give these pickles a unique flavor profile and they’re a great way to use up those prolific zucchini! I stood at my kitchen table the other day, hot from the Texas sun and just a bit overwhelmed by a pile of garden produce. I do some canning and dehydrating, but my first food preservation love is fermentation. It’s incredibly simple, healthful, and empowering in our journey towards sustainability. Making pickles this way is a snap! In five minutes I had prepped entirely homegrown ingredients and completed the making of a gallon of pickles. These pickles are alive with probiotics, enzymes, and lots of fun bubbles that my children love. They require no canning on these hot summer days and I can make a couple of quarts here or a few gallons there, depending on how much or how little I harvest. These fermented squash raw pickles with cucumbers mimic the Kosher Dill Pickles so many of us grew up on. With all of the flavor and the added bonus of having a living food to serve our family, I make these pickles from various garden vegetables all throughout the year. 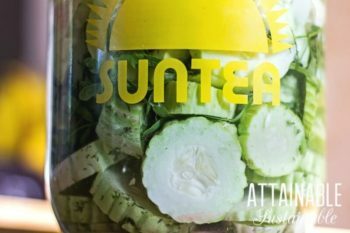 I like to mix the ever-prolific summer squash in to this fermented pickle recipe; you can use zucchini or yellow summer squash. It’s a great way to make fresh veggies palatable for picky eaters. A few pieces of cucumber pickle and a squash all go nicely on a salad or a sandwich and no one’s the wiser. These pickles are made through a process called lactic acid fermentation, a term many of us are becoming more familiar with. I truly believe harnessing this natural food preservation method is a critical tool if we are to move towards sustainable and even regenerative ways of living. I believe this so wholeheartedly that I wrote a book about it. 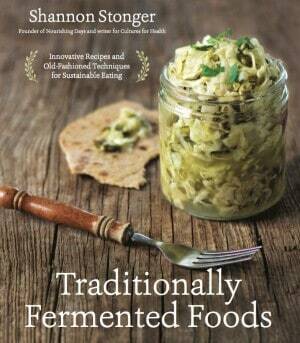 Understanding the basic biology of fermentation and harnessing it for a sustainable means of food preservation (and production) is what Traditionally Fermented Foods is all about. On our off-grid homestead we use the fermentation of vegetables, grains, dairy, beverages, and condiments as a means to live without refrigeration for these foods. The recipes, inspiration, and information in Traditionally Fermented Foods encompasses how we do that. If you want crunchy fermented pickles, do not skip out on the tannin-containing leaves. If you can’t get any from the list, a teaspoon of black tea per gallon does the trick. Vary the amount of salt you use, depending on the temperature. I go in depth on this topic in my book, but generally speaking use a little less if it’s cooler and a little more when it’s warmer. A cooler, slower fermentation is always preferred for flavor and texture. You must do everything you can to keep the vegetables well below the level of the brine. Employ various homemade or purchased fermentation weights. Fill your jar only 80% full to leave room for excess brine and the weights. With these brief points in mind, you can pickle just about anything with no fancy equipment – just salt, water, and whatever you are harvesting. Municipal tap water contains chlorine, which can inhibit fermentation, so be sure to use filtered or distilled water instead. A Berkey water filter provides clean water that’s free of toxins. Great for making your drinking water free of chemicals, but perfect for fermentation, too. 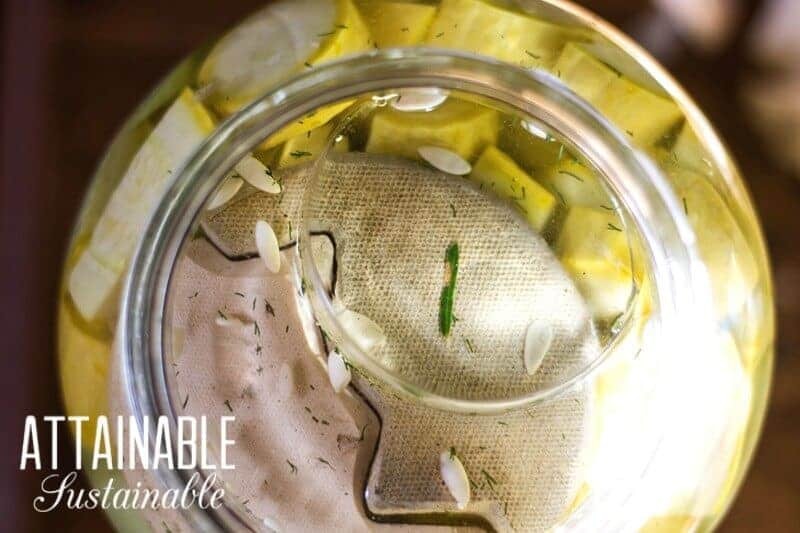 ★ Did you make these fermented pickles? Don’t forget to give it a star rating below! Squash are always in abundance in the summer garden. Here's a unique (and easy) way to use them up and share the bounty. Place half of the garlic, half of the dill, and half of the red pepper flakes in a gallon-sized jar. (A repurposed sun tea jar works well.) You can also divide the ingredients between two half-gallons or four quarts. Chop the cucumbers and squash into large 1" pieces and add them to the jar(s) until they are half full. Layer in the other half of the garlic, dill, and pepper flakes along with the tannin-containing leaves. Fill the jar 80% of the way with the remaining cucumber and squash pieces. Add the salt to the top of the vegetables. 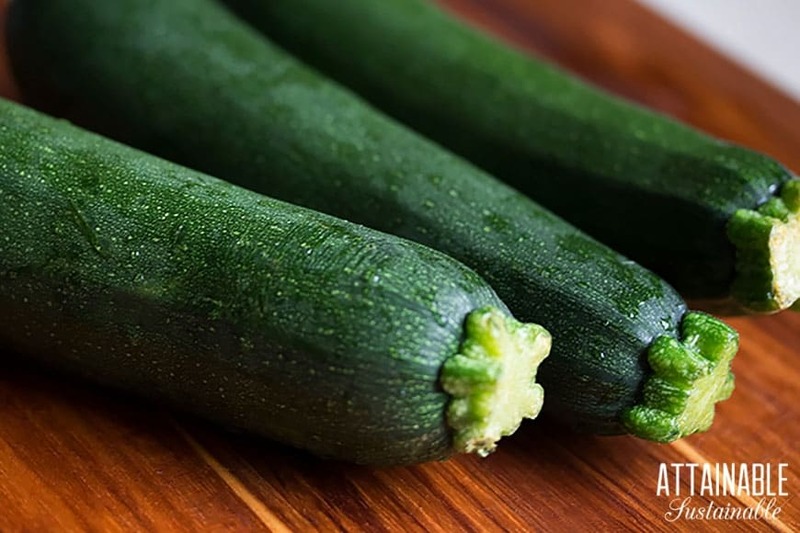 Pour in enough water to completely submerge the vegetables by 1/2 - 1 inch. Place a fermentation weight on top of the vegetables to weigh them down to below the level of the brine. Heavier is better; these guys float. Close the lid tightly onto the jar. Place the jar at cool room temperature to ferment for 1-3 weeks, aiming for a longer, cooler fermentation. During this time you will have to "burp" the jar to release some of the carbon dioxide that builds up as a by-product of fermentation. To do so, simply open the jar quickly but carefully, listen for the sound of pressure releasing, and then tighten it back up swiftly. Any time pressure appears to be building in the lid, repeat burping for the first week. After the first 7-10 days the fermentation process moves on to another stage and the carbon dioxide production tapers. After a few days the brine will begin to look cloudy - this is a good sign! You can begin checking the pickles for tang and flavor after one week. If they are tangy enough, move them to cold storage in a cellar, basement, or refrigerator. They will keep for months if left unopened. 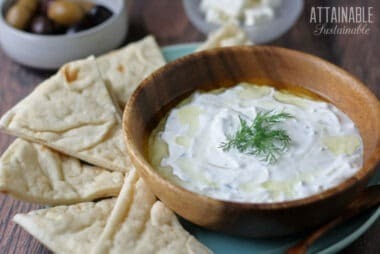 This recipe makes one gallon but the beauty of fermentation is that you can make any quantity. A good principle is enough veggies to fill your jar 80% full. 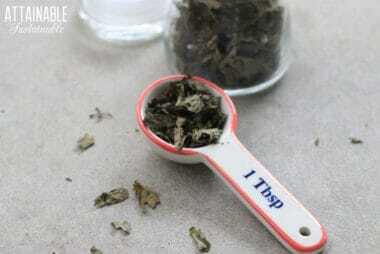 Add herbs, ~2 Tablespoons of salt per quart of vegetable, and water to cover. When determining how much salt to use, opt for the lower end of the range if you are fermenting below 75 degrees. Use the upper end of the range if you are fermenting in hotter temperatures. Shannon Stonger is the founder of the blog Nourishing Days, where she shares her family's journey towards sustainability. 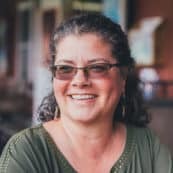 She is the author of The Doable Off-Grid Homestead, Traditionally Fermented Foods, and the sourdough baking book 100% Rye. She holds a bachelor's degree in chemistry and lives with her husband, five children, and various farm animals on their five-acre homestead in Texas. I totally didn’t know that black pepper can help in the same way that grape leaves / bay leaves could help with crunchiness. Does pepper have tannins as well? I definitely need to do some more research on this. Thanks for sharing! Can glass marbles be used as weights when pickling? I don’t see why not, though they could be hard to keep in place. Good recipe. Easy to make.